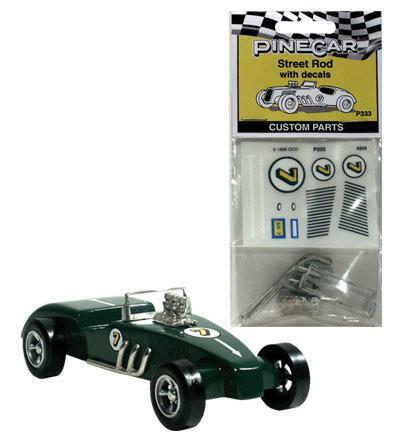 This Package Contains One Sheet of PineCar Dry Transfer Decals (Street Rod) and Custom Casted Parts for Your Derby Racer. Retail $6.99 SAVE 27% ! Decal Sheet Size: 2-1/2" x 2"
These dry transfer decals are the fastest and easiest way t customize your car. High quality rub-on decals that can be rubbed around contours an over textures, unlike stick-on decals._ Applies in seconds to any clean surface without the mess and bothe of wet process decals.. There's no clear film around the edges of the decals.. Colorful number logo, white arrows, and black stripes..
For maximum durability and a glossy finish, you may apply a ligh coat of gloss clear spray (not included)..
Stripes can be cut shorter or transferred end to end for longe stripes..
99.9% lead free on casted parts. Metal casted exhaust pipes (2), windshield (1), engine (1)..